As things have been a little quiet since the last trailer, I thought I'd write this post to explain some of what happens between the filming of an episode of Un:Bound Video Editions and it finally going live. The first step is to log all the footage we've shot. This speeds up the post-production process, the bread and butter of which is the editing. Now, UBVE is an unusual mix of scripted material and reportage. The scripted bits are relatively easy - it's just a case of stringing together the best takes. Editing the interviews is an altogether more laborious job. Invariably there's more footage that we can fit into the show. On UBVE #1 there was roughly 6 hours of interviews to squeeze into about 20 minutes of screen-time. A first pass weeds out the less interesting material, the second pass starts cutting out good stuff and a third pass tries to fit what's left into a logical order without losing the context under which answers were originally given. Once a sequence has been edited, music and sound effects can be added. It took a long time to audition and select all the royalty-free music used on the pilot episode, but I've done pretty much the whole score for Zombies myself, which has helped speed things up. But then I always find ways to slow things down again. Alongside the editing, the biggest job on UBVE #1 was all the special effects. This was such a big job because while I'd done some basic special effects before (adding lightning and explosions to footage, that kind of thing), I hadn't done anything really complicated and I hadn't used After Effects. Thus I did prolonged battle with a fearsome and remorseless learning curve in order to replace a badly green-screened wall at Pan MacMillan's office in London with a window view of magic zapping away the top half of the BT Tower. Pic. 1: This is a shot from the original footage. Pic. 2: This is after I digitally replaced half the room. The green screen wasn't too helpful because the hand-held camera and lack of reference points meant I had to position that metallic window frame manually for each frame (the frame, its reflection and the cityscape are all static photos - the sky is from some time lapse footage of a lightning storm off a Spanish beach). 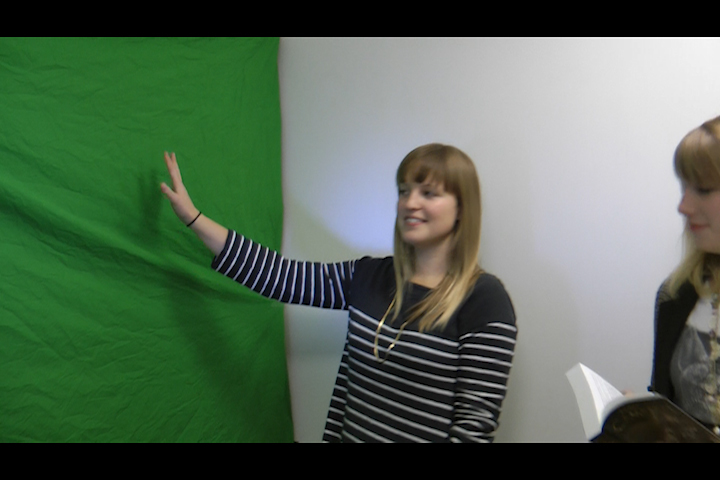 You can just see green fringing around Chloe's hand, where the colour keying couldn't get a tight enough match. Video 1: You don't get much of a look at it in the finished episode, but this is the straight video of the skyline and BT tower unobscured by camera moves. Of course, that's only the start of this sequence, which runs through a number of scenes and needs synching up with dialogue before effects and music are added. Still, once that's done, the episode should be pretty much done and UBVE #3 shouldn't involve me learning any complicated new tools.